The Guardian monitors picture and sound quality. It does this by comparing the results files of two sets of readings made of colors and tones presented by the projection and sound systems into the auditorium. In the case of a DCinema presentation, a DCP is played by the DCinema system and a matching sequence file is run in sync by the Guardian system. There are standard DCP/Sequence File pairs supplied with the system and available on our Customer FTP Site. Custom sequences can be made, for example to add a 25 Hz test to the LFE, by modifying the .xml file and adding the 25 Hz tones to the Playlist. There are many reasons that DCPs other than the basic ones supplied on the ftp site need to be created. For example, the decision might be made to test an entire array of speakers instead of each individual speaker in a modern "Object-based" system. In that case, an ArrayUpperLeft and ArrayUpperRight DCP would be in the standard playlist. Then, if one of those arrays failed for some reason a DCP that played through each speaker could be run. Or, in the case of monitoring a satellite, cable or blu-ray system a DCP would not be appropriate: the colors of d-cinema are not the same as the satellite REC 79 colors. Plus, we typically like to test an entire system such as blu ray to scaler to projector or Blu-ray to alternative audio switch to amplifiers, etc. In that case, a set of tones and color plates should be made on a Blu-ray disc. Likewise, a satellite feed, or something that imitates a satellite feed should be used to test that chain. So, there are two things to learn, and we'll start the process by making a DCP and to make a matching sequence file. How to create a DCP and sequence that would test R, G, B and White at full intensity. A Warning Plate, 1 Second of Black, 2 Seconds of full intensity White, 1 Second of Black, 2 Seconds of full intensity Red, 1 Second of Black, 2 Seconds of full intensity Green, 1 Second of Black, 2 Seconds of full intensity Blue. And Excel file with all the Steps of the sequence, which has been saved as a CSV file. The CSV_2_GSQ executable file which is zip'd up in the link. 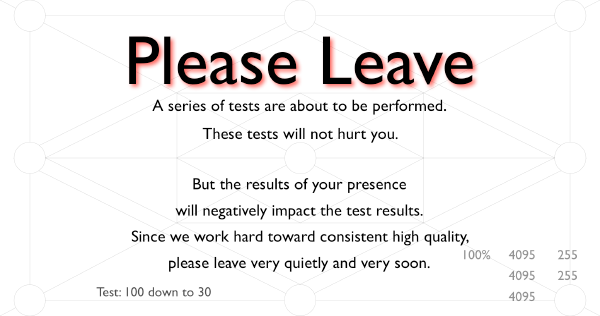 We start with a plate that gives notice to anyone who happens to be in the room that a test is going to run. If you are making your own plates, give the colors 1.5 seconds. The black or white plates in between can be .5 seconds. Since we might want to put different DCPs or Playlists and sequences back-to-back, it is a good practice to not make the final plate black since that would make two black plates in a row when a second DCP is butted against another. There is a sequence creator on the ftp site, which essentially asks for the following steps to be followed. Import a CSV file of the steps that you want to perform.